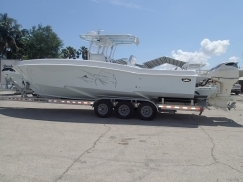 w/ 115 Evinrude, hydraulic steering, nav lights, baitwell in console and more! 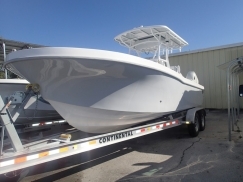 This boat is still in production and certain modifications are able to be made. Contact us at 954-922-8890 to request a custom quote. 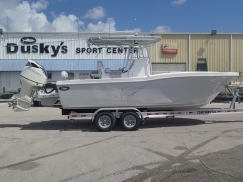 w/ Suzuki 200, 60 gallon fuel capacity, aluminum t-top, transom seating with backrest, VHF radio, 7" SIMRAD w/ transducer, three step ladder, twin batteries, saltwater washdown and more! 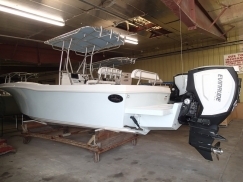 w/ 200 Evinrude G2, hydraulic steering, 4 post t-top, baitwell in console, transom seat w/ backrest, 7" SIMRAD, Stereo w/ 2 speakers, three step bracket ladder, twin batteries, Rabud saltwater washdown, and more! 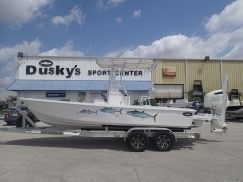 w/ 300hp Suzuki, 100 gallon fuel capacity, t-top, baitwell in console, trim tabs, twin batteries, all composite stringers, insulated fish box forward, VHF radio, Marine Mat, 9" Simrad EVO 3, fold down transom seating with backrest, 6" jackplate and more! 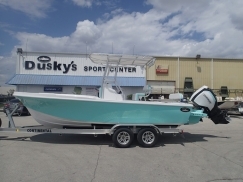 w/ 300HP Evinrude G2, twin 60 gallon fuel tanks, t-top, baitwell in console, transom seat w/ backrest, trim tabs, twin batteries, vhf radio, HDS-9 Gen 3 w/ chirp, stereo w/ 2 speakers, porta potti, DC outlet inside console, underwater lights, under gunnel lights, saltwater washdown and more! 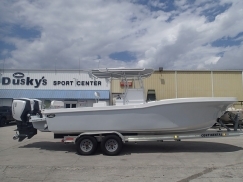 w/ 350hp Suzuki, 100 gallon fuel capacity, deluxe console t-top, deluxe stand up console, leaning post w/ livewell, Lenco trim tabs, Lee's 16' sidewinder outriggers, twin batteries, yacht chair, 12" SIMRAD EVO 3 Depth/GPS, Rabud saltwater washdown, underwater and gunwale lights, fold down transom seat with cushion and backrest, and more! 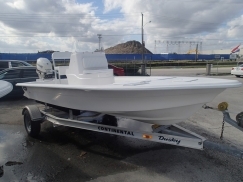 w/ 300 Suzuki, hydraulic steering, 4 post t-top, leaning post w/ livewell, transom seat w/ backrest, Lenco trim tabs, VHF radio, 9" SIMRAD, stereo w/ 2 speakers, three step bracket ladder, LED spreader light, Rabud saltwater washdown, underwater & under gunnel lights, DC outlet in console, electric horn, removable sunshade in bow and more! 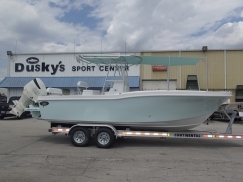 w/ twin Suzuki 350, hydraulic steering, 4 posted laceless t-top, fiberglass radio box, Lee's 16' sidewinder outriggers, fiberglass tackle launcher seating combo, yacht chair upgrade, stereo with speakers and amp, 16" Simrad EVO 3, 1000 watt transducer, VHF radio, removable transom seat, coaming bolsters, 40" Armstrong ladder, front table, stairs in console, head and sink in console, built in tackle boxes and more!